Origami paper with patterns that you can print yourself! By Stéphane • Pattern generator • Monday 12/05/2014 • Be the first to comment! Where can one find paper with beautiful patterns? To make your origamis stand out, you can use Japanese washi paper with printed patterns, but washi paper is expensive and hard to find. Washi paper patterns are exquisitely beautiful, but you may not always find the pattern or the colors you seek for your origami models. An economic alternative is to print yourself your own paper with patterns. You can use standard photocopy / printer paper for most origami projects (except for the most complex, or for some special types of origami like modular origami, tesselations etc.). Create and print yourself your own paper with patterns! With the pattern generator below, you can choose from all the available patterns on Colorigami: a selection of 45 patterns with simple patterns like stripes, dots and checkered patterns, and many elaborate patterns inspired from Japan of course, but also mosaics from Arabia, old European wallpapers, floral patterns, birds, fruits, geometric patterns etc. And we regularly add new patterns. For each pattern, you can choose both the color of the pattern and the background color, which gives you an infinite number of combinations. To print the origami paper you created, you can use the print icon. You will directly obtain a printed square that you will just have to cut out before folding it. If you want to generate a pattern for another use, you can use the disk icon to generate an image in the png format. The pattern is repeated in a 600x600 pixel image. 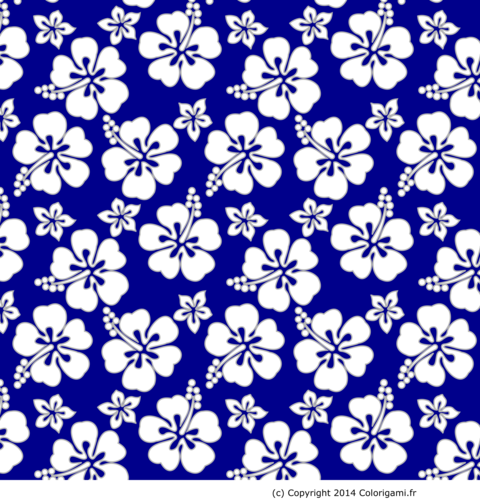 Patterns are seam-less, which means you can crop the image to keep only the non-repeated pattern, and use it as a background in Web pages for instance. The pattern size is often 150x150, 200x200, 300x300 (depending on the pattern). You can use the "Canvas size" function in your imaging software (Gimp, Photoshop, Paint Shop Pro etc.) to crop the pattern. The HD icon will generate a high resolution image of the pattern (3600x3600) which should be more than enough for all your projects, even giant sized ones! For manual projects (not digital: scrapbooking, gift wrapping etc. ), you will get better results by printing directly with the print icon, as the pattern will be in very high resolution. Generated patterns are placed under the licence Creative Commons - Attribution-NonCommercial-ShareAlike 3.0 Unported (CC BY-NC-SA 3.0). You can use the patterns in your non commercial projects by indicating the source (a link to Colorigami for a web site, or the site address for an offline work). You can modify and redistribute the pattern under the same licence as long as you specify that Colorigami is the original author. In case of doubt, please contact us !